9 new 'Star Wars: The Last Jedi' light side posters released – AiPT! 9 new Star Wars posters. What’re you waiting for?! Get in here! Whether you’re a Star Wars fan, sci-fi fan or just an art fan, this is a post you’ll want to pay attention to. Through the official Star Wars Instagram account Disney has released nine new light side posters to celebrate the upcoming release of Star Wars: The Last Jedi. With release day only two short weeks away, Disney has given us a glimpse of new characters and spaceships, old lovable characters and the legendary Millennium Falcon. You can feast your eyes on them below! That’s one hell of a pilot! 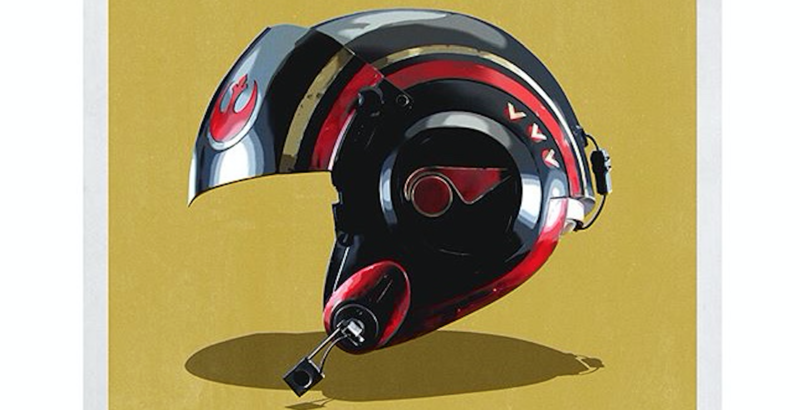 Combat helmet of Poe Dameron, X-wing fight pilot and the commander of the Resistance’s Starfighter Corps. Hero of the battle of Starkiller base, he can and will fly anything to take down the First Order. It’s only right to have Poe’s best pal and partner following right behind him. BB-8 may be skittish at times but no one questions that atromech’s loyalty to Poe when it counts. Arguably the most famous droid in the Star Wars universe and without question the bravest. Starfight mechanic, X-wing copilot and all around adventurer, R2-D2 has served generations of Skywalker’s without distinction. Don’t you call me a mindless philosopher you overweight glob of grease! One half of the droids every Stormtrooper is looking for, it’s C-3PO! The mystery of the red arm remains unsolved. The mysterious Caretakers. A new race to the Star Wars universe, these creatures reside on Ahch-To, the planet Luke Skywalker has been taking refuge on. They’re cute, they’re fuzzy and chances are every child will be asking for one come Christmas. We don’t know much about the Porgs except that they’re on the good guy’s side and they love Chewbacca. First wielded by the legendary chosen one Anakin Skywalker, this elegant weapon from a more civilized age is now wielded by our hero Rey. It’s the ship that made the Kessel run in less than 12 parsecs. The most infamous starship in the galaxy. She may not look like much, but she’s got it where it counts, kid. The T-70 X-wing fighter is the signature combat craft of the Resistance’s Starfighter Corps. TIE pilots beware. Let the countdown to ‘Star Wars: The Last Jedi’ begin!